Parking area and trailhead are on the south side of Rt. 2 in Randolf, NH, one mile west of Pinkham B (Dolly Copp) Road. It is also 5.3 miles west of Rt. 2's western junction with Rt. 16 (in the Upper Village of Gorham). Mt. Adams is New Hampshire's second highest mountain and is generally considered its most difficult mountain to hike. This is because of the immense vertical distance that all of its trails climb on their way to the summit. The elevation gain of the most popular route to Adams is greater than that of any other in New Hampshire, and is also greater than that of many mountains out west, including the highest peak in the Rockies. Mt. Adams and its Northern Presidential neighbors share in "the worst weather in America" that Mt. Washington receives, so hikers must be extra cautious. Mt. Adams's sharp summit boasts a view that many consider the best in the Presidential Range. Its striking look at the Great Gulf's headwall is unmatched. Mt. Madison (included in this hike), smallest and northernmost of the Northern Presidentials, has a much less rugged summit with a view that is just as nice. On the north slopes of Mts. Adams and Madison is a vast trail network maintained by the Randolph Mountain Club. This means that there are a huge number of choices when climbing them. Many of the trails are among the most scenic in the Whites. The route we describe here is a loop over both peaks which tours as much of these mountains' scenic beauty as possible, including Durand Ridge, Star Lake, and the many cascades on Snyder Brook. The ascending trail, Air Line, climbs by way of Durand Ridge, a narrow and craggy pathway which rises high above King Ravine. The views from this alpine trail are among the best. To begin your hike, head to the kiosk at the west end of the parking area and follow the trail, crossing the Presidential Range Rail Trail (a gravel bike path) and entering a power line clearing. Bear right onto Air Line. Just after entering the forest, pass The Link on the right, then in 0.2 miles, cross Sylvan Way. Continue at easy grades through the woods for 0.4 more miles, then cross Beechwood Way. Just after this, the trail crosses a seasonal stream. Continue for 0.2 miles, then bear left to stay on Air Line where Short Line continues straight. Here, the trail becomes steeper and climbs 0.1 miles to a junction with Randolph Path, which comes in on the left. The two trails join for a short distance, then Air Line turns left, as do you. The trail now continues for 0.7 miles at mostly easy grades, but becoming steeper, with occasional rough and rocky sections. The forest around you gradually becomes darker and thicker. Then, the trail switchbacks up a steep slope and begins the rocky ascent up the west side of Durand Ridge. For over half a mile, the trail angles steeply up the slope, becoming even rockier the higher it gets. Some sections are quite rough, including a few rock scrambles near the end. After this difficult climb, Air Line levels on a wet, mossy plateau where it meanders for about 0.3 miles before passing Scar Trail on the left. Here, the trail begins to climb again, and continues at moderate (but much easier) grades for 0.6 miles before it leaves the forest and emerges in the alpine zone. After just a short climb in the open, you are greeted with breathtaking views. To your right it is a sheer 1000 feet down to the talus-filled floor of King Ravine. The amazing headwall of this ravine is filled with cliffs, slides, and cascades. Ahead of you on the trail is the section of Durand Ridge known as the "Knife Edge" - not quite as intimidating as Katahdin's ridge of the same name, but still impressive when seen from below. High above are the imposing Adams and Madison, their summits hidden behind shoulders, but still quite impressive. The first views into the distance are to the northeast. Across the valley through which runs Rt. 2 is the low, rolling Crescent Range. Behind and to the left are the more distance Pliny and Pilot Ranges. To the northeast is the city of Berlin; above, the view extends a great distance into the Great North Woods and Maine. Further to the east is the rugged Mahoosuc Range: the summits of Mt. Hayes, Cascade Mountain, Bald Cap, Mt. Success, Mt. Carlo, and Goose Eye Mountain align from lowest to highest; off to the left, the range curves around to Old Speck Mountain, a Maine 4000-footer. Off to Old Speck's left is distant Elephant Mountain, also in Maine. 0.1 miles after entering the Alpine Zone, pass Upper Bruin on the left. In another 0.1 miles, after going by pointed Needle Rock, pass Chemin Des Dames on the right, which drops into King Ravine at frightening grades. A wild climb of 0.3 more miles brings you to the end of the Knife Edge section of the ridge. Here, Air Line Cutoff goes left toward AMC's Madison Spring Hut. The ascent continues over less rocky terrain for 0.2 miles, easing as it passes King Ravine Trail and turns right to join Gulfside Trail. The AMC hut can be seen under the conical Mt. Madison to your left. In a short distance, turn left back onto Air Line. The trail now climbs over jagged alpine boulders. Watch carefully for cairns, which may blend in with the giant gray mass. As you near the top, all traces of dirt and grass disappear as boulders take over completely. The trail also becomes very steep. The summit is reached in 0.6 miles from the Gulfside Trail. At the summit, dramatic views into the Great Gulf open. Its bowl-shaped headwall is seen under Mt. Washington, across the wilderness. The headwall of the also impressive Jefferson Ravine drops sharply from the ridge between Adams and Jefferson. The deep green of the wilderness contrasts with the pale gray alpine peaks, creating one of the most striking views in the White Mountains. Across the wilderness to the east rises the Carter-Moriah Range. Closest is Wildcat Mountain and its ski area, with various mountains around Kearsarge North behind it. Carter Dome rises across the partially blocked Carter Notch from Wildcat and the ridge leads across Mt. Hight, through Zeta Pass, and up to South and Middle Carter. Mt. Moriah is at the north end of the range, with a few peaks in the Evans Notch region behind it. Then the view swings around to Mt. Madison, with the Mahoosuc Range beyond. To the north, the view remains much the same as you saw it ascending Durand Ridge. Descend from Mt. Adams the same way you came up until you reach the junction with Gulfside Trail. Turn right, and continue straight onto Gulfside Trail, passing the way you ascended on the left. Descend easily on a well-constructed stone pathway for 0.3 miles with Madison Spring Hut in sight ahead. Reach the hut after going through a small patch of trees and passing Valley Way on the left. For a scenic side trip (included in trip mileage), turn right onto Star Lake Trail and walk an easy 0.2 miles to Star Lake, a picturesque alpine pool under the cliffs of Mt. Quincy Adams, a spur of Mt. Adams. Just before the lake, reach a fork. Turn right for the closest view of the lake. Back at the junction, turn left onto Parapet Trail and stroll by the lake, then in a short distance, turn right onto a path out to the ledge outcrop known as The Parapet. This ledge has fine views over the Great Gulf as well as back over Star Lake and up to Mts. Adams and Madison. Note: you may visit Star Lake without a side trip by following the Star Lake Trail down from the summit of Mt. Adams, but this way is steeper and more difficult to follow. To continue to Mt. Madison, return to the hut and turn right onto Osgood Trail (across from Gulfside Trail; begins along the north side of the hut). Quickly pass Pine Link on the left, then pass through a patch of trees. The climb begins at a steep grade, climbing over boulders and rock slabs, but is still gentler than the final ascent of Adams. Look back for views of Mt. Adams, Star Lake, and Madison Spring Hut. The climb steepens further up, then the trail drops to the south side of the ridge and travels easily just below the crest. Soon it climbs quickly back to the top, then follows the narrow, rocky spine over several bumps to the summit. At the summit, views are excellent. Although the view of the Great Gulf's headwall is now blocked by Mt. Adams, new vistas of several interesting features are gained, including peeks down into Madison Gulf, a better view to the west, a great look down the Howker and Osgood Ridges, and an exceptional view down into the Androscoggin River Valley. The descent described here begins on Watson Path, a very rugged trail which stays above treeline for 0.7 miles. A far less scenic, but much easier and more sheltered option is to return to Madison Spring Hut and descend on Valley Way for one mile, then turn right onto Lower Bruin and continue 0.2 miles to Watson Path. Then you may follow the bottom half of the route described here. From the summit of Mt. Madison, descend on Watson Path over broken rocks, these more similar to those on Mt. Adams. The northern view will be ahead of you to enjoy for a long way. Watch for cairns very carefully, as they are not obvious on this trail, particularly near the top. It soon passes an overhanging boulder on the left, then continues descending steeply for 0.3 miles over the boulders. The trail then crosses Pine Link in a small plateau. Approaching this crossing, the sections of trail over boulders become mixed with gentler areas through patches of krummholz. This easier descent continues for 0.4 miles before the trail enters the forest. Near the bottom of this section, look across the Snyder Brook Valley for views of Durand Ridge and the Knife Edge. Once below treeline, the trail becomes steeper and remains very rough. 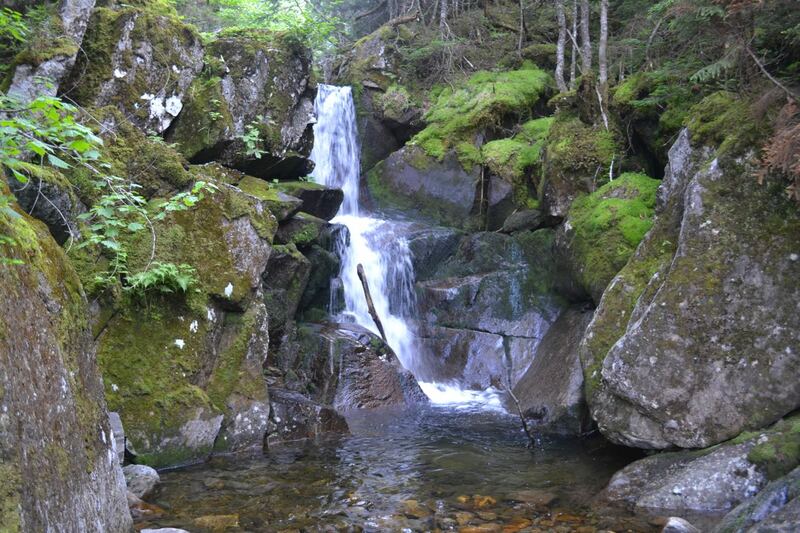 After a scramble-filled descent of 0.4 miles through the woods, the trail crosses Snyder Brook just below Duck Fall, a two-tiered plunge over mossy rocks. On the other side of the brook, bear right to stay on Watson Path as Lower Bruin goes left (this is the bottom of the easier descent route suggested above). Scramble up the steep brook bank, then pass a sign marking the unimpressive Bruin Rock. Just past this, bear right onto The Brookside. The descent becomes easier now, with only a few steep sections. Soon you reach Snyder Brook again, soon passing Salmacis Fall, a long and graceful water slide. There are views of this cascade both from above and below. Pass Kelton Trail on the right 0.1 miles beyond. The trail soon pulls away from the brook and descends more gradually through an open forest for 0.9 miles. It then approaches the brook again, crosses to the other side, then proceeds for 0.3 miles to a three-way junction right next to the brook. Cross Snyder Brook for one last time to a junction on the opposite shore. Bear right to stay on Brookside, then bear right again onto Valley Way. Pass Beechwood Way on the left, then after a short walk, bear right onto Fallsway for the last feature of the hike. This less-used loop heads to the brook and passes Tama Fall, a rushing, 40-foot cascade. Pass Brookbank on the right, then briefly join Valley Way. Bear right back onto Fallsway, and pass Salroc Fall. Signs designate Upper and Lower Salroc Fall. Both are fine cascades, although the upper half is much larger and prettier. After a scenic 0.4 mile walk along the brook, pass Maple Walk on the left, then drop down to Gordon Fall, a rocky, two-tiered drop. Continue on Fallsway for 0.2 miles, cross the Presidential Range Rail Trail, and end your hike at the east end of the Appalachia parking area.